Cold Fire™ is a multi-purpose fire suppressing agent that beats other foams hands-down! Completely 'green' and non-toxic, Cold Fire puts out any Class A or B fire, hydrocarbons or non-polar solvents, as well as metals, tires, and asphalt. Used by fire departments and police departments all over the world. 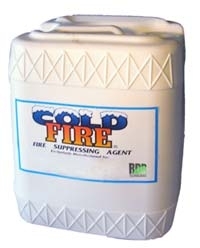 Cold Fire is ONE agent that can replace SEVERAL products - Class A, A/B, 3-6%, AFFF & AR-AFFF. Cold Fire Concentrate - 1 Quart Cold Fire Aerosol Extinguishing Spray - 12 oz Cold Fire Concentrate - 55 gallon drum Cold Fire Aerosol Extinguishing Spray - WINTERIZED All Season Blend - 12 oz.